I follow a lot of paranormal pages and belong to a number of paranormal groups on Facebook. It always disturbs me to see the advice people give each other when it comes to certain paranormal topics. It's like the blind leading the blind. I know this is a field where there are arguably no 'experts' and technically MOST ideas are simply conjectures and theories, but we can and must do better. I am sick of seeing advice being given that is at best, unhelpful, and at worst, both mentally and physically dangerous. I came across this graphic today and thought that it was a pretty good way to summarize the thought process you should go through before offering up advice or commenting on a paranormal post, especially those posts in which someone is asking for help or advice. T - Is it True? When you're offering advice regarding a field where there are very few known absolutes, it can be difficult to keep your own opinion or even what you believe to be true out of it. But, its important that you do your best to only offer up the facts. However, if you absolutely feel it is necessary to throw in a little popular or personal opinion, make sure you qualify your statements as such. Where applicable, provide links and sources that back up your statements and give the person asking for advice a place to go for more information. H - Is it Helpful? Do you REALLY have something to say that is helpful to the situation? Does your statement have educational value or is it just pointless chatter? Are you fear mongering or legitimately trying to help? Are you hijacking the post with your own issues that are detracting from the original poster's? Are you even qualified to give an opinion on this matter (especially when it comes to things like health issues)? 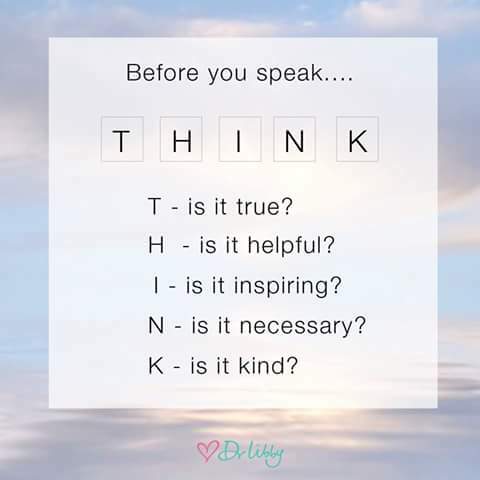 Before replying to a post asking for help, ask yourself these questions, and ask yourself whether or not you would find your statement helpful if it were you who needed the help. I - Is it Inspiring? Okay, I'll admit that 'inspiring' posts don't really fit with this scenario of offering advice. But, bonus points if your post is actually inspiring in any way, especially if it inspires someone to do further research on a topic or to look at an issue with a different point of view. Be an inspiration to other posters by staying on topic, offering sound advice, not giving opinions on topics which you aren't qualified to give opinions on, and being polite, kind, and professional. N - Is it Necessary? This one sort of ties in with the helpfulness of a post. Is what you're saying necessary to contribute to the post and stay on topic? Are you offering a fresh point of view, or are you just needlessly reiterating what others have already discussed at length without adding any additional value? K - Is it Kind? It seems like many people have issues with staying kind. For those who have studied the paranormal field for a long time, it can be frustrating when people ask very simplistic questions that we assume should be easily answered or debunked. We can't forget that we're all in different spots along our journey in this field, and thus have a wide range of knowledge and experience. Further, many of these paranormal groups are frequented by members who don't actively study the paranormal---but rather come there when they are experiencing things they can't explain. It's much more frustrating when people who ask for advice obviously have already made up their minds and don't really want to hear what you have to say...especially when what you have to say is of a more skeptical nature. It is extremely common to see posters react to any type of questioning or offering of explanations that don't fit their preconceived notions to get extremely defensive. That defensiveness often devolves into some pretty rude comments and accusations. If that happens to you, be the bigger person. Stand by the facts and accept the idea that not everyone is going to see it your way. Stay kind and stay professional. Don't stoop to name calling, shaming, or any other negative behavior.